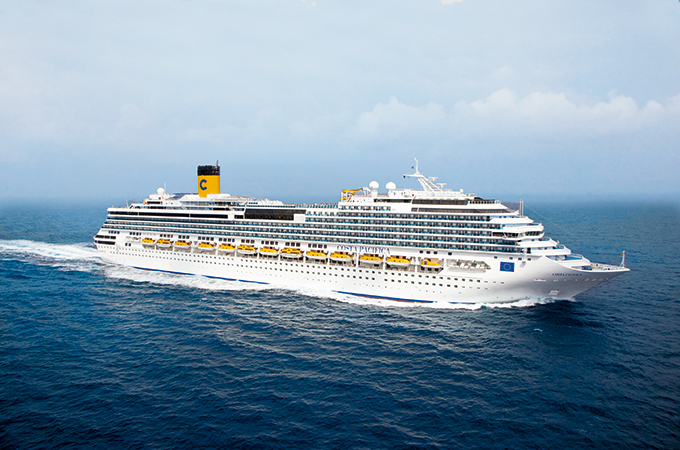 Last month, TTN had the fortune of being invited by Alpha Holidays Dubai to be onboard the Costa Pacifica, while she was doing her final Mediterranean itinerary for the summer. A handful of important regional agents joined the trip, all keen to discover the world of cruises from the perspective of an ideal Mice product (for more, read box out). Costa Pacifica, nicknamed ‘the music of the sea’, has melody at its heart, with different symphonies forming the basis of its interiors. Music and art are intertwined on the Costa Pacifica: there are more than 308 original works of art on board, and almost 6,000 prints that can be admired in the public areas and exclusive suites. The cruise features five restaurants with appetising and exquisite menus; 13 bars serving the most exclusive cocktails, as well as chocolate, coffee and quality cigars; and a spa overlooking the sea. The 114,500-tonne, 290.2-m-long and 35.5-m-wide ship became our home for four memorable nights and five days. Turkish Airlines provided air support for myself and all the agents in its comfortable business class, with easy, relaxing stopovers in the airline’s premium class lounge of Ataturk airport. We arrived at Barcelona a little early, and this gave us time to do a quick spin around the important sights of the Spanish port city courtesy Experiences in Spain, with a sumptuous lunch at the five-star Majestic Hotel & Spa Barcelona, which is quickly becoming popular with patrons from the Gulf region. The property was working on their halal menu when we visited and I must report that some of the dishes plated were perfectly authentic, while others were also delicious with a creative Spanish twist. Shisha is also on the cards on their rooftop, which offers the most fabulous views in all of Barcelona. Come evening, our break in Barcelona drew to a close and we moved with bated breath towards the picturesque port to embark our ship. A quick and efficient check-in process followed, and it did not take more than 30 minutes to get the entire group on board and into the grand foyer. The ambience of a cruise ship varies dramatically, depending on the location of the cruise and the nationality of guests. It is safe to say that our crowd was fun, lively and communicative, with lots of Italians on board. With about 3,000 guests and 1,000 crew members, we were looking at a beehive of activity: people purchasing last-minute shore excursions, wi-fi packages, collecting maps, registering their credit cards in the self-service totems and others just seated around enjoying a drink before the ship leaves port. So, our next stop was the gothic port of Valencia in Spain, with its beautiful cathedral of Santa Maria, a quaint town square and several shopping opportunities. Day trips from a cruise are quite convenient, you can either leave the organising in the hands of experts and buy one of many excursions offered by the cruise operator or you can go on your own, if you don’t like being bussed and bossed around. There is one obvious advantage of paying a little extra and going with the cruise’s excursions: you won’t miss the boat if there is a delay! In our cabin, neatly placed on the bed is our on-board diary for the next day, with a host of interesting events and functions happening all over the various outlets of the cruise. The next day is spent entirely on board, while the ship moves from Valencia to our next stop – Cagliari in Italy. This sea day, gives us the opportunity to experience the facilities of the cruise and put it to the test of boredom. Contrary to my expectations, I was only too happy to be at sea. I did not miss land at all. Least of all at night, when standing in the balcony of my Ocean View Balcony Cabin, I could see and hear the ocean closer than I have ever in my life. An experience I missed at least a week after the trip came to an end. The Voice of the Sea was being filmed on board one day, another day saw us playing bingo, watching top-quality theatre performances, shopping for watches and scarves at an alarmingly reduced rate, dressing up in white for the ‘White Night’– the list of activities was exhaustive. The meal and beverage options were extensive too, but so were the fitness opportunities on hand, including Latin dances, jogging on the outer deck, gymnasium, swimming pools and even the odd game of basketball. I was travelling with my toddler and was quite surprised to see her favourite cartoon character Peppa Pig on board, organising special kiddie lunches and shows. There are two kids clubs on board, one for the little children and another for teenagers. All in all, the kids are kept well entertained while you do your own thing. The spa is magnificent, facing the sea, and comes complete with a large steam and sauna area, hot pool, solarium, you name it. After a busy day at sea, it was time to explore Cagliari, in a vehicle we rented just outside the port. The capital of beautiful Sardinia, Cagliari is one for travellers and not tourists, peppered with history and green plantations, and not much else. The beauty of Sardinia is best experienced from the road, with a chatty driver and his cute Italian accent. Before we knew it, we were back on the ship and in Rome the next day, ready for our trip back home.